‘Stomping Ground Terminal 3 ½’ is located between domestic terminals three and four, giving travellers a taste of Melbourne’s locally produced and independent beer, coffee, wine, cider and food. 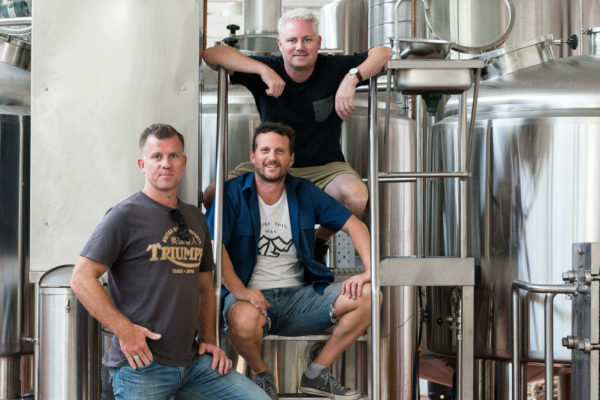 “The motivation behind it was that we travel through Melbourne Airport frequently and we got increasingly frustrated at not seeing any diversity in beer,” Stomping Ground co-founder Steve Jeffares told Brews News. Jeffares approached Melbourne Airport with the idea and believes independent beer is continuing to infiltrate all corners of society. “We think it’s important for people traveling through Melbourne airport that they get a taste of this city and a taste of what Melbourne is famous for – drinks, arts and culture – which could be better represented and that’s why they embraced the idea we pitched to them,” he said. The pop-up will sell only Melbourne and Victorian-based products. Six of the ten taps will be Stomping Ground’s most popular, easy drinking beers, with the remaining taps constantly changing to offer a variety of flavours, so travellers always have something new to try. It will have a large screen where people can relax on deck chairs on a lawn area to watch major sporting fixtures like the Australian Tennis Open, the Ashes, Big Bash Cricket and Formula 1. Melburnian cubby house creators, Castle & Cubby, will be providing a children’s cubby area made out of recycled materials so that children coming to the airport are occupied. Occasional appearances and activations from Victorian entertainers, sporting events and cultural groups are also planned for the space. Although the pop-up will finish in April 2018, Jeffares hopes that, “at the very least, independent beers are made available at the existing bars and restaurants in the airport”. “Certainly if I knew someone was doing it, I think I’d get to the airport a little earlier and have a great beer, or I’d stick around if I knew that I could have a great local, independent beer and sit in the sun and watch the cricket,” he said. Stomping Ground Terminal 3 ½ will be open between 6am and 9pm (licensed 10am to 9pm) seven days a week starting today, Friday December 15. I have to agree its a much nicer and affordable options for people who have to wait for a plane, or friends or family picking up or dropping off. Hope Melbourne Airport learns from this concept , and do something to keep it!